Podcaster and Heretich Robert M. Price as been kind enough to write a guest blog post for Mighty Thor JRS today. I am very excited and I would like to thank Robert for the opportunity to host this Guest Blog. Now without further adieu here is Robert’s awesome guest blog. I am 63 years old. I have a vivid memory of a moment back, I guess, in 1970, when it dawned on me that I could actually feel the horizons of my imagination expanding. I was a child of the 1960s, and I loved the music, but I never took any of the drugs. Still haven’t and don’t intend to. My brain seems to be working pretty well as it is, so why risk tampering with it? So what was the mysterious substance responsible for my mind expansion? Of course it was fantastic literature. I was happily surfing the floodtide of paperback reprints of the classic pulp fiction. Avidly reading the creations of Robert E. Howard, H.P. Lovecraft, Edgar Rice Burroughs, Lester Dent, and so many others changed my life. Their fiction grabbed hold of me and has never let go. I wandered starry-eyed amid the wonders of the intangible worlds these long-gone fantasists had conjured. Who needs drug-induced hallucinations when reading a book can open the windows of the mind to Barsoom, Lemuria, and Middle Earth? I think maybe I was reading a Frazetta-covered Captain Future paperback when I had my epiphany. Or maybe it was Lin Carter’s Tower at the Edge of Time. I had just a few years earlier embraced evangelical Christianity. (I’ve always thought that I Was Teen-aged Fundamentalist would make a great movie!). So, you see, I was twice a nerd! I wasn’t “there,” so I was “square.” And pretty darn happy about it! From my present perspective, I’d say religion had already placed me in a fantasy world with strong similarities to those of pulp fiction. Fundamentalism posited a universal contest between cosmic forces of good and evil, destined to climax in an epic battle like the one on the plains of Mordor. Jesus played the role of the once and future king, and I was Sam Gamgee. It would be some seven or eight years before I would conclude that the Christian epic was fully as fictive as those of my beloved Conan and Doc Savage. By this time I had come to view the Bible as itself a kind of fantastic fiction, and this is not to badmouth the Bible. I love it more than ever! I write books about it. I once told L. Sprague de Camp that I owed him my (first) Ph.D. degree, because it was he who engineered the series of Lancer Conan paperbacks, which made me a fanatical reader. I remember how, in eighth grade, my English teacher, Mrs. Brummerstedt, passed out index cards on which we were to record the titles of all the books we would read during the semester. She no doubt expected no more titles than those of the (uninteresting) books she would assign. But this was in 1966, and I had just become a Conan addict. She was pretty surprised when I kept asking for more index cards and inscribed them with the titles of the fantasy classics I was rapidly devouring! I wound up pursuing both trajectories. Both issued in writing careers. I have produced reams of papers, articles, and books on the Bible and on the Cthulhu Mythos. Much of the same critical methodology applies naturally to both, since both are rich, complex works of epic fantasy. And to this heady mixture I must add comic books. I have always loved superheroes—as well as their ancient prototypes, Hercules, Achilles, Theseus, and the rest. Isn’t it obvious that Superman Captain America, and Spider-Man are not merely like the mythic heroes of old, they are our modern myths? As such, they embody our moral ideals and our aspirations. We are Clark Kent, but the best we have the potential to be is Superman. There are evils we may fight against, even if they are not named Brainiac or Darkseid. I shake my head in stunned disbelief every time I hear some idiot parent complain that her kids are wasting their time on comics. Don’t they see that superhero comics are a “gateway drug” to reading books? Why couldn’t people see that even the gruesome EC Comics were morality tales, warning against revenge and taking the law into one’s own hands? And, if you’ll forgive my cynicism (I am a jaded old man, after all), superhero comics provide the momentary illusion that we live in a world where justice may prevail. Robert M. Price (born July 7, 1954) is a Mississippian by birth, lived in New Jersey for most of his life, and has recently resettled in North Carolina. Occasionally someone familiar with Robert M. Price as a writer on religion comes across the same name attached to books related to H.P. Lovecraft, Robert E. Howard, etc., and inevitably wonders if it could possibly be the same person, all the more since one also finds titles on South Africa and on guns credited to a Robert M. Price. Those last two are not our man, but the horror writer and the religion writer are indeed the Jeckyll and Hyde sides of the same fellow. When did it begin? When was I first tainted by the cosmic contagion that is Lovecraft? Actually, it is no big mystery. Back in 1967, when I was first enthusiastically swimming in the paperback revival of pulp fiction from Ace, Lancer, Dell, and others, I was comparing notes one afternoon with my pal Russ Farrington, and he suggested I read these new Lancer paperbacks he had just finished, H.P. Lovecraft’s The Colour out of Space and The Dunwich Horror. I did. (At least that’s the way I remember it; Russ tells me he recalls me telling him about HPL!) And to this day I could probably tell you just where I was and how I felt while reading each one of those wonderful tales! I was thirteen years old, which I much later discovered is the optimum age for discovering Lovecraft. Encountering the Old Gent then can mark one for life. It certainly marked me! Lovecraft has loomed much larger in my life than he does right now, but he still casts a pretty long shadow over me, and I look forward to an opportunity to reread this or that tale again soon. And I’m planning on buying the Cthulhu action figure when it comes out. Joshi, a cultured and gracious young man, kindly invited me to drive up to Providence, Rhode Island, to meet “the Providence Pals,” the gang who put together Necronomicon Press publications. It was great fun meeting publisher Marc Michaud, illustrator Jason Eckhardt, writers Don and Mollie Burleson (they weren’t married yet, but it wouldn’t be long) and Peter Cannon, and fan editor and collector Ken Neilly. What a bunch! What a hobby! We would walk around various Lovecraft sites in Providence (places he had lived, places he had mentioned) and would haunt bookshops and examine our finds over pizza. I treasure those times! Soon I joined the merry crew again for a regional horror convention at Roger Williams College in Rhode Island (NeCon 1981) where I was delighted to hear Les Daniels, Peter Straub, Michael McDowell, and other genre pros, disappointed only that Stephen King had bowed out. It was here that I met another great friend and colleague, Will Murray. A few years later, I would be tagging along with Will through the streets of Lower Manhattan, looking for the exact spot where Richard Henry Savage, the prototype for the fictional Doc Savage, was killed in a cart accident (yes, that’s cart, not car). Around the same time, Will led a bunch of us on an eerie expedition through South Boston to recap the route to Pickman’s studio in “Pickman’s Model.” I will never forget rooting around in Copp’s Hill Burying Ground where we discovered that, just as in the story, it was honeycombed with a series of tunnels to which staircases beneath false tombstones led! Occasionally we ran all-fiction issues of Crypt of Cthulhu, and for these I lined up new material by the pros (Lin Carter, Gary Myers, Brian Lumley, Frank Belknap Long) as well as old manuscripts by Howard, Carl Jacobi, and others. Crypt functioned very much like the old fanzines contemporary with Lovecraft and his generation, like The Acolyte, Fantasy Magazine, and Phantagraph. Lin Carter took an active interest in Crypt, and before long a bunch of us New Jersey and New York fans had begun meeting every other Saturday at his Manhattan apartment for the New Kalem Club. Sometimes the ancient Frank Belknap Long would make his way across the city for the meetings. We basked. These fiction issues, filled with Mythos collector’s items and rare obscurities, led directly to the next phase of my Lovecraftian involvement, editing fiction anthologies. It was 1990, and a bunch of us were shooting the breeze at Eileen MacNamara’s apartment during the Lovecraft Centennial conference hosted by Brown University. Phil Rahman, kingpin of Fedogan & Bremer publishers, invited me to put together a hardcover anthology of Mythos tales, and the eventual result was Tales of the Lovecraft Mythos, followed many years later by The New Lovecraft Circle and Acolytes of Cthulhu. Three years after this, Chaosium Publishers approached me with the idea of my compiling collections of Mythos stories to answer the needs of a younger generation of fans who had discovered Lovecraft through the medium of fantasy role-playing games. The new series would focus on a Mythos deity, a magic book, a major locale familiar to the fans from their role-playing and allow them to catch up with the source material. I did a dozen or so of these, and several more are awaiting publication from Chaosium even now. I branched out to other publishers, including Arkham House, for whom I put together Flowers from the Moon and Other Lunacies, a collection of rare early Robert Bloch pulp tales. Now I’m trying to finish out the series of topical collections with new publishers including Mythos Books, Die, Monster, Die! Books, Lindesfarne Press, and Hippocampus Press. Perhaps my most bizarre (and most fun!) adventures in Lovecraftianity were the series of biennial “NecronomiCons,” or Cthulhu Mythos conventions, held in Danvers, Mass, or Providence. I loved pontificating on panels to packed rooms of Mythos addicts. Even more I loved hosting the Cthulhu Prayer Breakfasts which formed the climax of each Con. We would gather for a breakfast buffet and present lifetime achievement awards to elders of the movement including Robert Bloch, Gahan Wilson, L. Sprague de Camp, Ramsey Campbell, Brian Lumley, Dirk W. Mosig, Fred Chappell, and others. 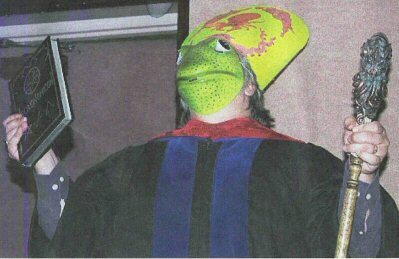 And then I would come on stage, dressed in Innsmouth finery, and give a sermon. I’d lead into it with some stand-up material, then do a serious and (I hoped relevant) homily, which would inevitably slide into a crazed display of Cthulhuvian tomfoolery, as I would begin to rant about the return of the Old Ones or to speak in tongues (R’lyehian, specifically), and lead the crowd in strategically reworded hymns. It was always a thrill. Too bad those days are over! My precious keepsake from back then is my copy of the first edition of the Schlangekraft-Barnes Necronomicon (you know, the one that looks like a high school yearbook), whose once-blank end pages are covered with the autographs of major Lovecraftian writers, many of them now dead and suffering Hell’s torments. I’m glad I thought of it before it was too late. Now no one could duplicate it. What a great post! I had meant to read this one when I first saw it, but the new semester started (I, too, am a professor), and I got wrapped up in work. My mind expansion began when I was a kid, a child of the 80s. I’m a generation removed from Robert M. Price. What expanded my imagination? Dungeons and Dragons! And from D&D, I’ve sought out the Appendix N authors listed in the Dungeon Master’s Guide. My schooling in the masters of the genre continue. Just last night I was reading “At the Mountains of Madness.” But all told, I’m more of a Howard fan than Lovecraft.